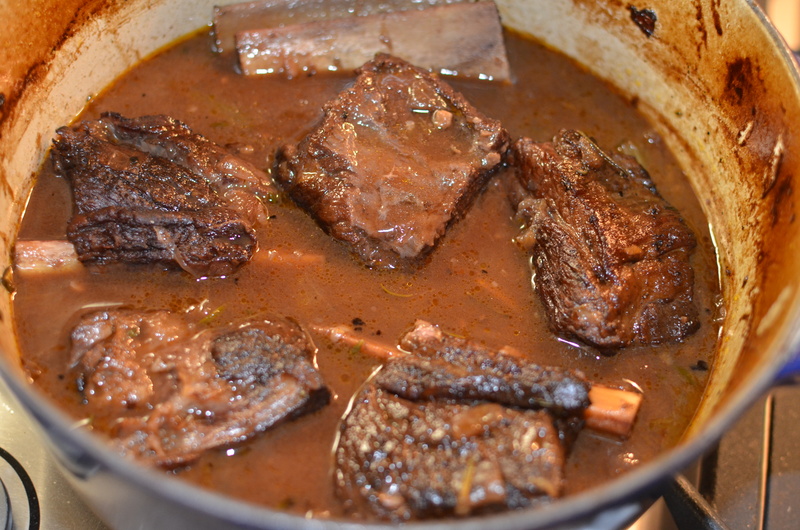 Braised short ribs are such a satisfying dish to make; the fall off the bone, tender meat just warms my soul. 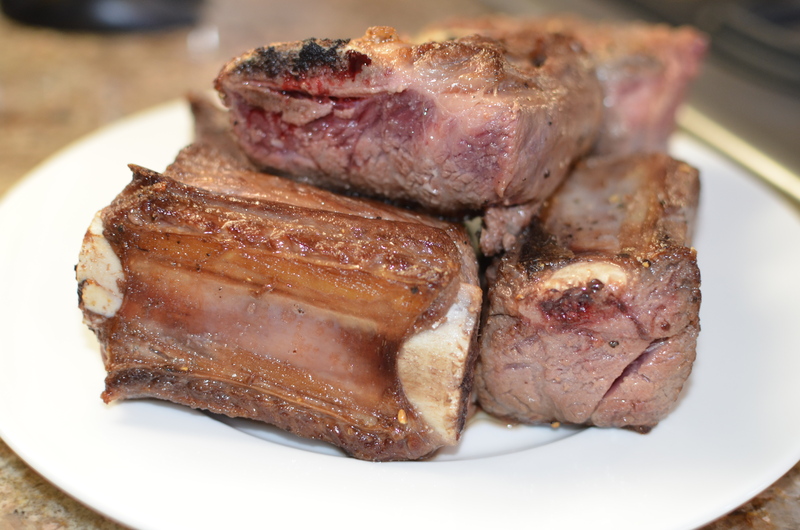 These ribs are perfect for a special occasion meal or even a date night, your loved one will be very impressed when he/she walks in the door and smells these braising away. And please don’t be turned away by the cook time, there is very little prep work and the oven does most of the work for you! I like to serve mine with mashed potatoes, creamy polenta, or this time per bf’s request, mushroom risotto. 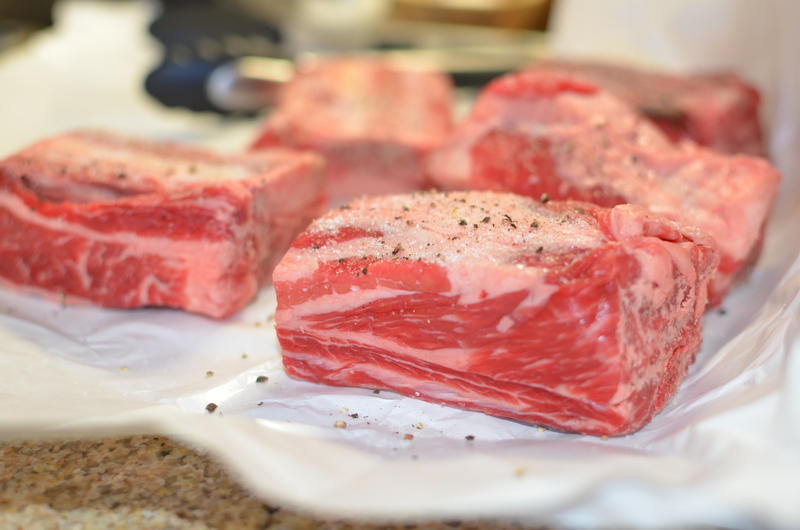 Pat the short ribs with a paper towel to make sure they are completely dry. Season the ribs with salt and pepper on both sides. 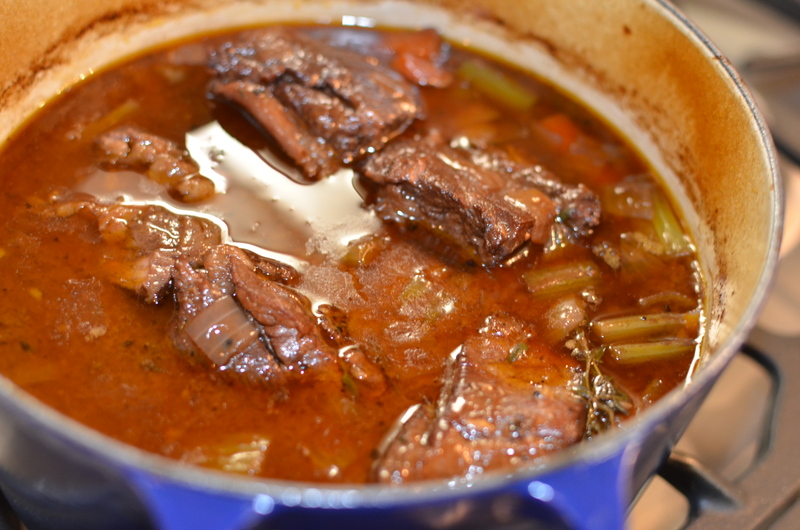 Drizzle 2 tablespoons of olive oil in dutch oven and place on high heat. 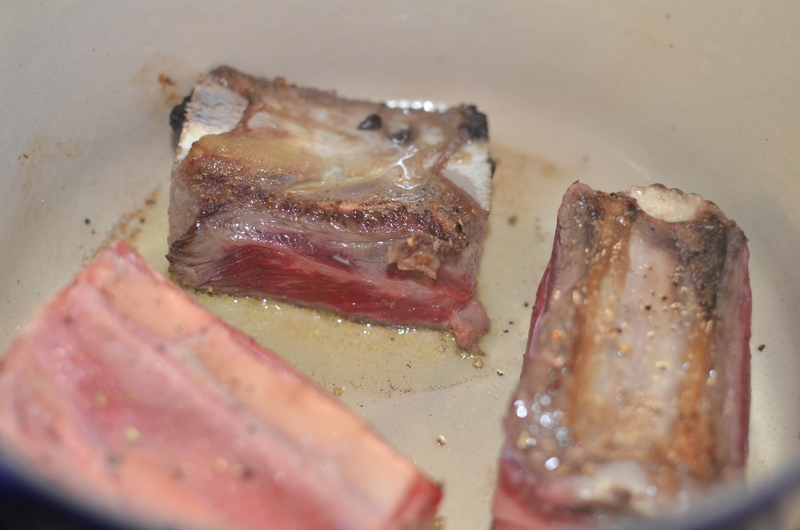 When the oil is shimmering, sear the short ribs on all sides in the oil. You may need to do this in batches- make sure not to over crowd the pan. 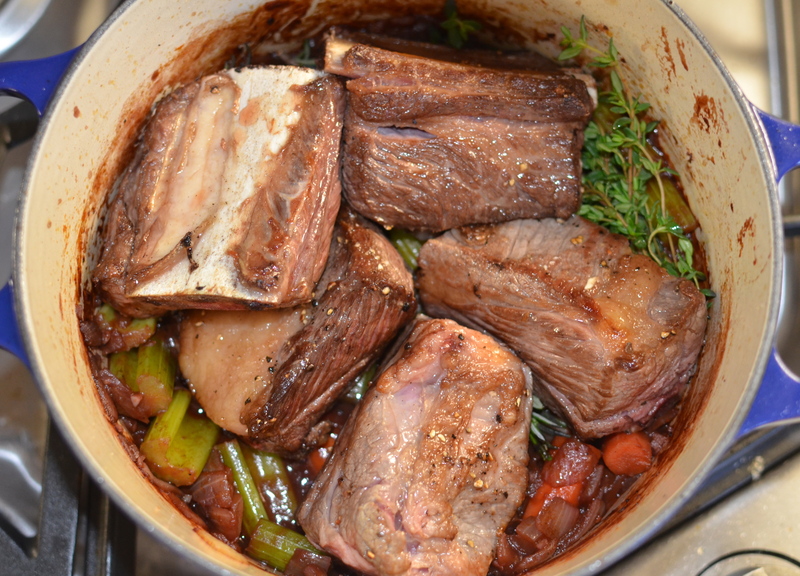 When the short ribs are brown on all sides, take them out and set aside. 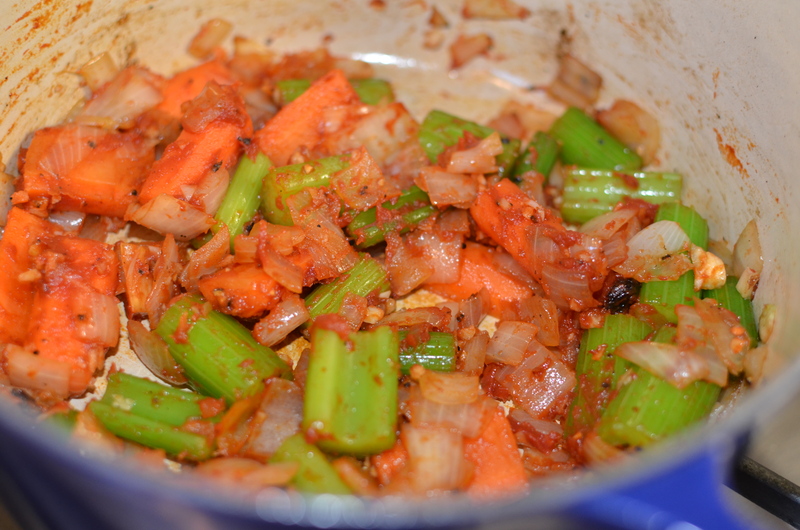 Cook the carrots, celery, and onion in the dutch oven over medium heat. Saute the vegetables until they get some color, about 15-20 minutes. 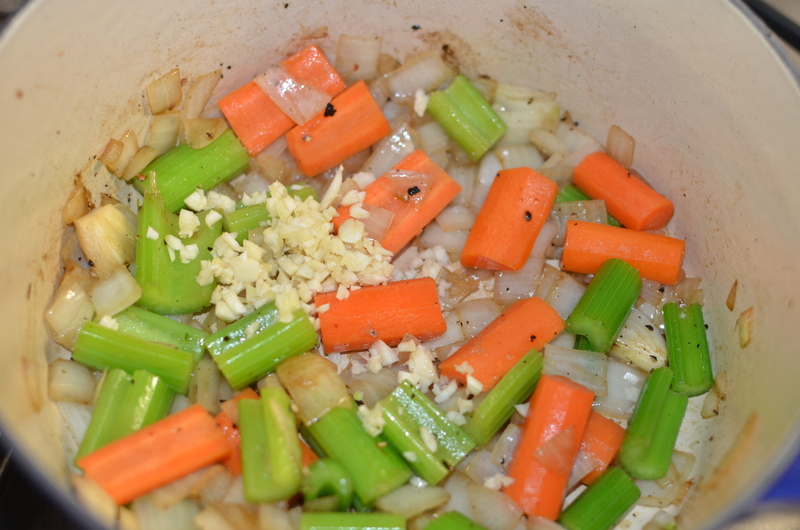 When they are about ready, add in the minced garlic. Season the vegetables with salt and pepper. 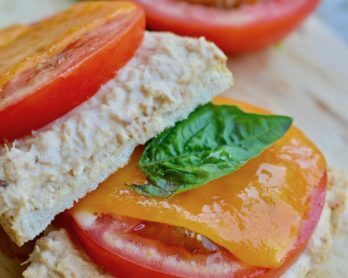 Add the tomato paste to the pan and cook for 2-4 minutes. 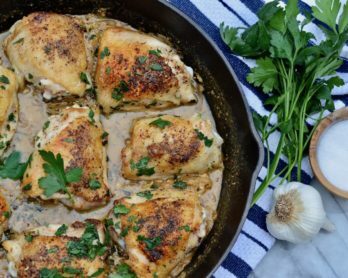 Pour in the wine over the vegetables and deglaze the pan. 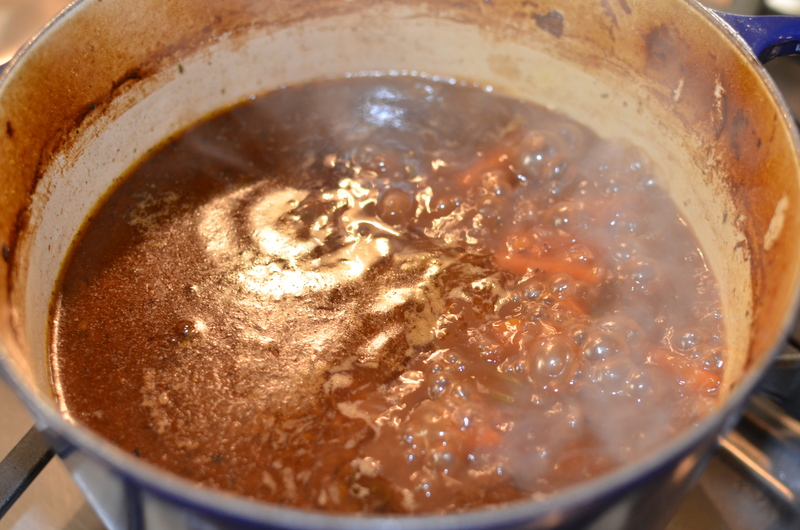 While the wine is reducing, scrape off all the brown bits from the bottom of the pan. 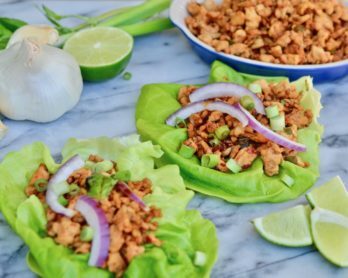 These bits are called fond, and they are full of flavor and will add depth to the sauce. 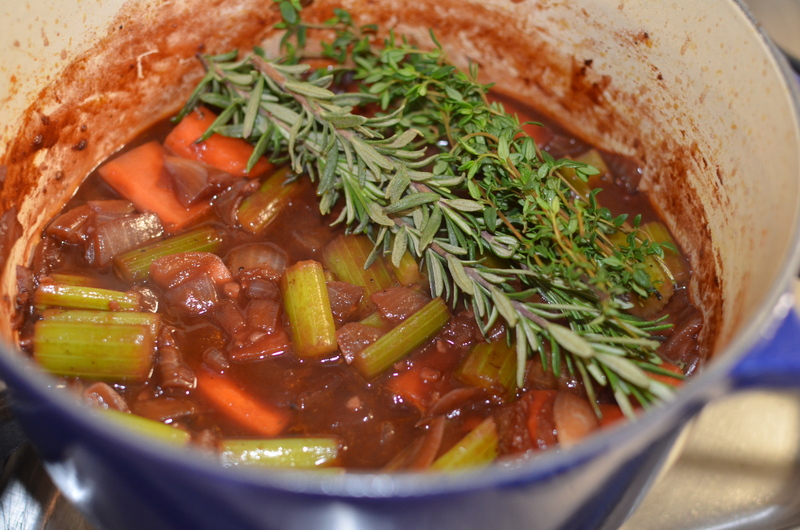 When the wine is reduced by half, add in the rosemary and thyme. Place the ribs back in the pan in an even layer. 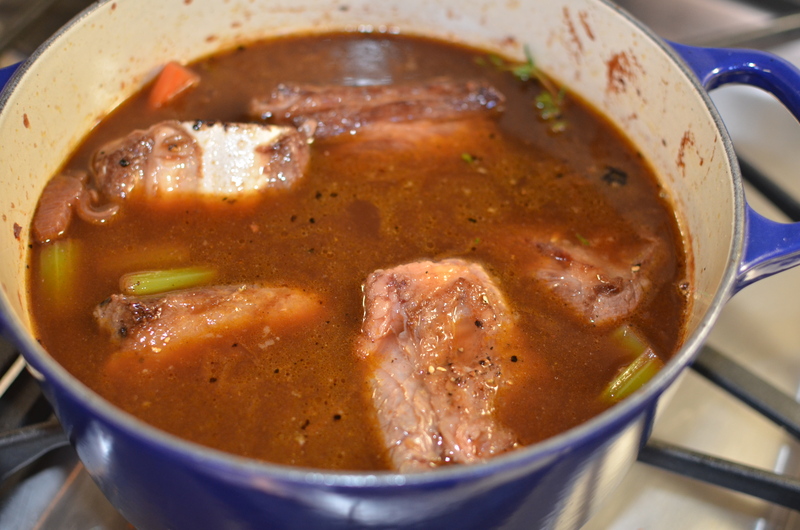 Pour in the beef broth until the broth comes just about to the top of the ribs. Cover the pot and put in the oven. Braise the ribs for 3 1/2 to 4 hours or until they are tender. I tend to check them every hour or so. When the ribs are super tender (some of mine had fallen off the bone) pull the pot out of the oven. Take the ribs out of the pot and set aside. Bring the liquid to a boil and let it reduce by about half. While the liquid is reducing, carefully skim the fat off from the top of the liquid. There will be a good amount of fat. 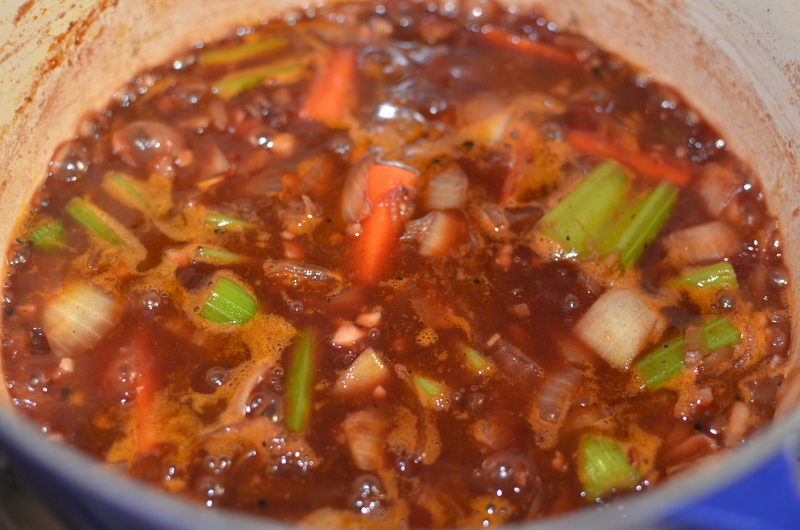 When the sauce has thicken and reduced, taste it for seasonings. You may need to add some salt and/or pepper. 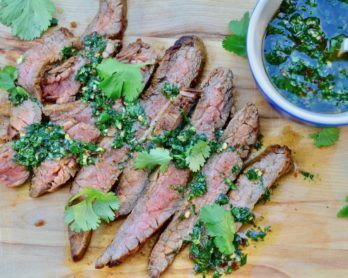 Remove the herbs from the sauce and place the ribs back in it. 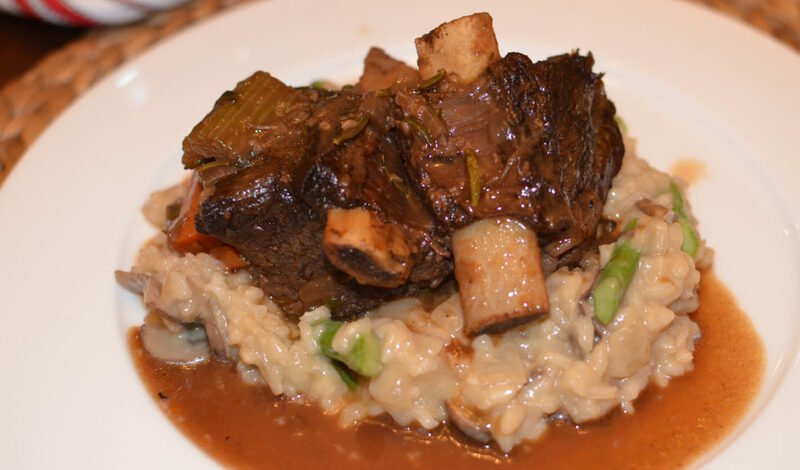 I serve the short ribs on a bed of risotto and top them with copious amounts of the glorious sauce/cooking liquid.